Dhokla reminds me of a very funny incident which happened few years back.My aunt Lm made the Dhokla once,keenly following a recipe from her favourite cookery show and gave it to my uncle when he came back from work.One bite into it and he said-Its very tasty but don’t make it again.Which pretty much sums up how it turned out. Whenever someone talked about Dhokla,the first thing which came to my mind was this.I was very biased and couldn’t imagine eating Besan idlies,as I use to call them.While going through the long list prepared by Srivalli for choices for the Indian Cooking Challenge,I hoped no one would vote for it so that I’d be spared from making it.But no luck,imagine,my least favourite was everyone else’s most favourite.Hmm..!! I kept postponing making it because I wondered who would volunteer to eat it as both of us have the same feeling towards it.Srivalli suggested making it in a small cup.I set about making it finally thinking let me try making it at least,if not eating. The recipe is foolproof,I can assure.Every step is explained in detail and you really can’t go wrong if you follow the recipe. [Unless you are like me,who saw that grated coconut was required for the tadka,but forgot all about it and put all of the coconut into the chutney!! ]Other than that,no problem at all. Mix ½ cup curds with ½ cup water. To this add the besan and mix well to get a lump-free batter, the consistency should be of idli batter, more of dropping not pouring consistency. Slowly add more water if needed else, add the soda. Keep it aside to rise for 1 hour. To the batter,mix in the citric acid, oil, salt, sugar, green chili paste and turmeric powder. Mix well. This has to be done just before pouring to the plate. The batter should be filled to only ½ as it will rise up. After adding eno the batter should not rest. Amount of sugar can be increased on preference. 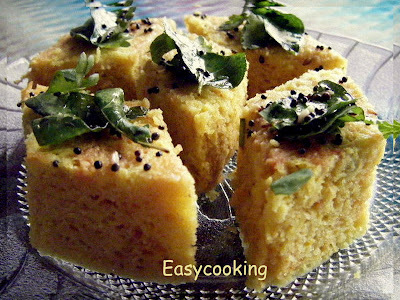 Dhokla can also be steamed in kadai filled with water and a plate tilted over it. Take all the ingredients except coriander in a food processor. Grind to a smooth paste. Then add the coriander and again grind. Remove to a bowl, add the remaining lime and serve with Dhoklas. I too love to try dhoklas for a long time,soon i should,looks very nice! Your pics speak the texture of the dhoklas!! 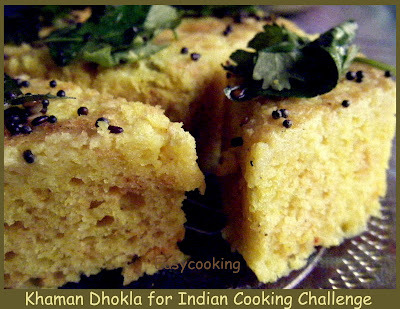 hmm u guys are rocking with the challenges...somehow hesitating to join..dhokla looks yummy..loved that cake shaped one.. The dhoklas look perfect and spongy! I agree enjoying dhoklas is an acquired taste. The first time I tasted in Bombay, I didnot quite like it. Liked your spirit to try it. Yours have come out well. Wow looks beautiful Divya...:)..Glad you joined us in the fun! love how you cut it diagonally! Wow!..did it come out Moist for you?? It was spongy, but dry and a bit hard for the first time, I attempted..made some changes and came out perfect! How can you resist having that one Divya ? looks so professional and soft..great garnish too !! they do look perfect, u will get used to it, its easy to make when u are expecting guests so i actually voted for it. Divya,Dhokla looks spongy and perfect..Superb clicks!! dhoklas looks perfect...fluffy & spongy..
could not make them as I couldnt get hold of ENO here.pchhh...missed it ths month although I wanted to try it badly. Yours came out very well. ohhh your dhoklas came out so soft and perfect Divya great presentation too. Have come out perfect. Love those diamond pieces. I prepared dhoklas and gave to my friend, but unlike your uncle he said.. please give me more..
Wow! I love dhoklas, but the white ones!! Yours certainly look delicious, can totally understand why everyone loved it!! Dhoklas have come out incredibly moist divya, fabulous! it looks great, im sure it tasted even better! Looks great... I need to get that Eno salt. Do we get it in stores here? 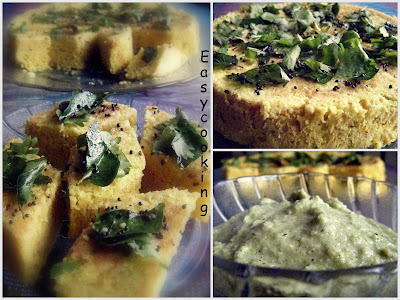 wooo soft and fluffy dhoklas...looks tempting..
Hi Divya, you have nice recipes in your blog. Check out Femlina.com. It is India's first women's social network. You can join and share your blogs, photos and videos about your recipes.